This meticulously crafted idol is made of resin. Easy to install, the idol can be a lovely addition to your home or office. 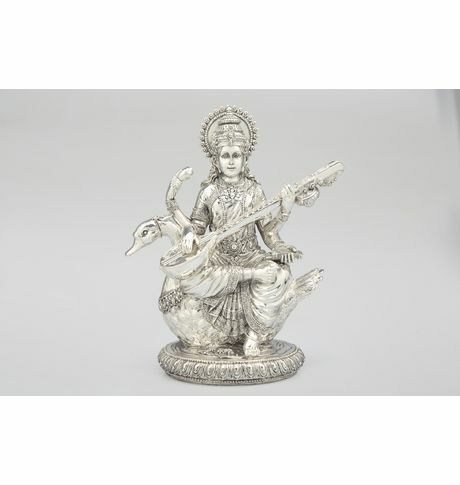 The silver vacuum plating on the intricately designed idol makes it apt for display anywhere. The idol is also a worthy gifting article to discerning patrons. This meticulously crafted idol is made of resin. Easy to install, the idol can be a lovely addition to your home or office. The silver vacuum plating on the intricately designed idol makes it apt for display anywhere. The idol is also a worthy gifting article to discerning patrons. Dimension: 17.5x12x21.5 cm. Weight: 1.1 kg. Made in Italy. Easy to maintain.Cancellation and Return Policy: • Exchange allowed post booking • No order cancellation or Refund transaction allowed at the store.